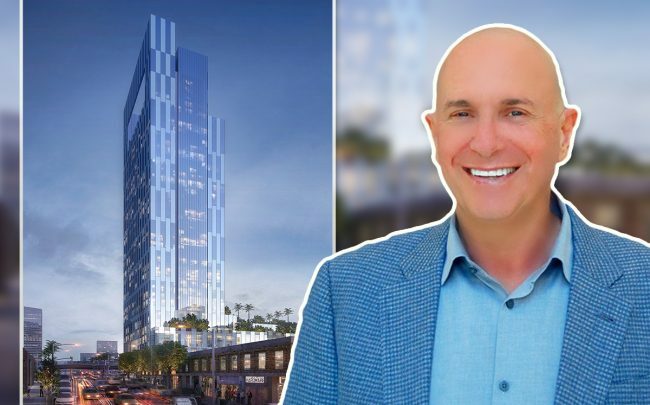 Sandstone Properties revealed new details about its 730-key hotel project near Downtown Los Angeles. Dubbed the Albany, the development is slated to replace a vacant 150,000-square-foot warehouse on Pico Boulevard. Sandstone’s revealed the renderings in a new project website, Urbanize reported. The project will rise less than half-a-mile away from the L.A. Convention Center, one of many developments that are transforming the surrounding area. Once completed, the Albany will include 63,000 square feet of banquet space and about 800 parking spaces. Renderings from architecture firm HOK reveal the 37-story tower will be 480 feet, and the building will include several decks. The modern, glass structure will also have freeway-facing signage, meant to “provide strategic promotion of Downtown convention activity,” according to its website. Sherman Oaks-based Sandstone acquired the site, located at 1330 West Pico Boulevard, in October 2017 for $41.5 million, records show. At the time, zoning laws prevented the firm from repurposing the 40-year-old property. But roughly six months after Sandstone’s big buy, City Councilman Gil Cedillo introduced a motion to rezone the 2.6-acre property for hotel development, paving the way for the Albany to rise. Last November, Anschutz Entertainment Group, which is already working on a $500 million overhaul of the convention center, filed plans for an 850-room expansion of the J.W. Marriott at L.A. Live.